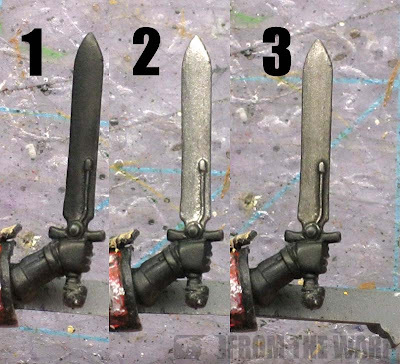 There are lots of different ways to paint power weapons. From the simple to the complex. Most of the time, this is what you get. A basic metallic basecoat, a quick wash and then a line highlight along the edges. And it works. For most of what we paint, this is perfectly fine. I had a reader ask me the other day about how to add some contrast to his power weapons that he paints with metallics without having to get into the whole NMM aspect of things. I figured I'd share the trick use when I paint some of my power weapons to push the contrast on the blades and give them a more menacing look. What you're going to need to do this? It's not much more than what you're already using. Your basecoat, your wash (for shading) and your highlight. I used GW Leadbelcher for my basecoat, GW Nuln Oil for my shade and Army Painter Plate Mail Metal for my highlight. In addition to those colors, you want to get out your black and white along with GW Asurmen Blue (GW Drakenhof Nightshade). I chose the Nightshade to give the power weapon some color and blue has a tendency to make metal look finished and polished as though they were crafted and not simply beaten into shape as an Ork or other race might do. It makes them look almost "machined." The use of other colors will give you different looks to the finished weapon. The process starts off the same as you would if you were doing the basic paint job. I prime black since I'm going to be doing a metallic basecoat. Make sure you have a nice, solid basecoat without any swirls or variations. I use GW Leadbelcher. It's one of the better metallics I've found out there after looking around. You want it to be as smooth as possible. Then give it a quick wash with GW Nuln Oil. This is where we depart from the standard practice. If we were doing it normally, we'd hit the outer edges with our highlight color and call it done. Instead, we're going to take a look at our power weapon and try to define some of the surfaces on the blade. 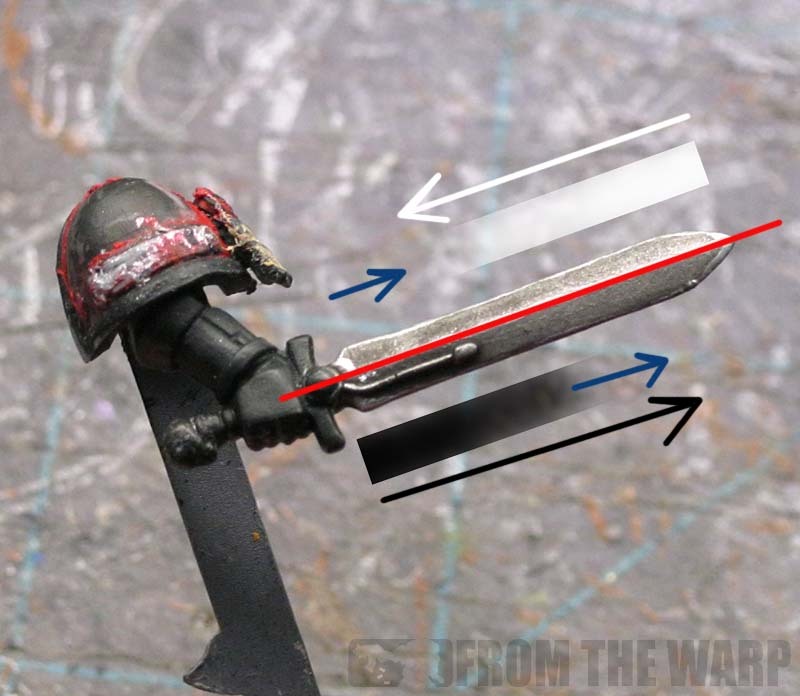 When we look at this blade in the position it will be on the model, we can see that the lower half (divided by the red line) will be in shadow, while the upper half will have light applied to it. 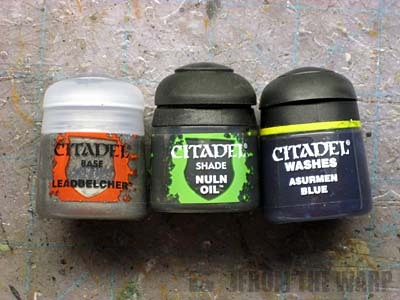 Since we know what half of our blade is in shadow, we're going to work from the lowest point back upward and apply our wash (Nuln Oil). It's going to take a few coats to build up the dark color. We just want to blend it into the existing color of the blade by the time we reach the tip. To really push the contrast, you can use some thinned black in the lower areas instead of using a million coats of wash to get it dark enough. Working on the top portion of the blade, we are going to start at the tip (opposite of where we started our shading) and work down. Using our highlight color, we are going to blend it into the existing blade color. To really push the contrast, you can add a very, very tiny amount of white to your highlight color if you want. I don't tend to do that, but instead use the white to create a fine edge highlight along the tip of the blade around my highlighted portion. Where does the blue fit in to all this? The blue is used two different ways depending on where it's added. For the black or shaded area, it's added at the transition point from the shadow to the regular blade color. This helps darken down that portion of the blade a little bit more and keeps it from looking "flat." For the white or light area, you can add a few thinned passes of it at the opposite end of your highlight. This will help add some color to that side of the blade and reinforce your highlight. Here you can see the finished weapon. I went a little overboard with the painting to show the effect. You can do this on your own and be much more subtle about it. You don't have to push the lights and darks as far. You really only need to do it enough to help define the shape and surfaces of the weapon. Your brain will fill in the rest. This effect is not NMM and does not follow along the same ideas. It's just a shortcut to help define the surface a little more. It doesn't take up too much time and can add a nice touch to your regular power weapons if you're one of those who like to paint them the basic metallic color like I do. 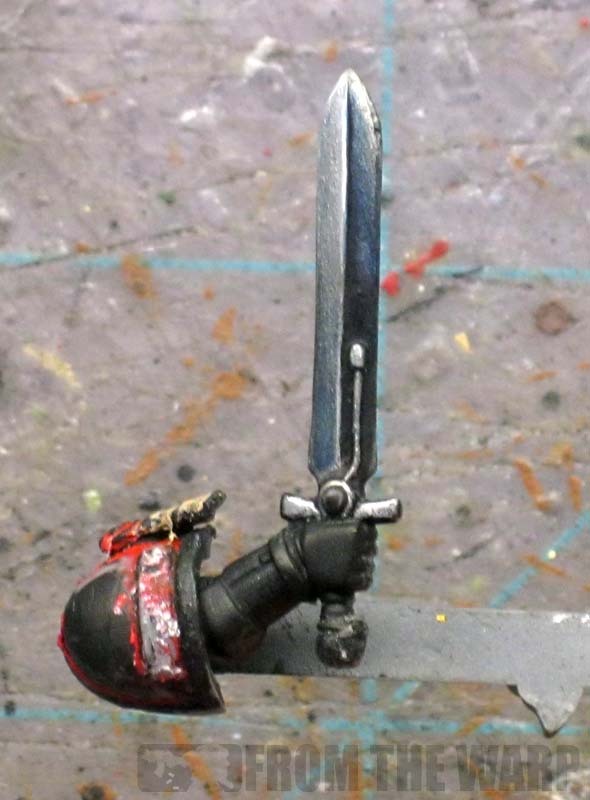 UPDATE: I had a reader send me a pic of the super simple NMM effect he does on his power weapons. While it's closer to NMM than the technique shown in this post, I thought it was worth sharing as it doesn't quite go all the way into NMM either. He doesn't use metallics, but paints his power weapon with grey. Over that goes a simple line highlight along the edges that is blended into the base color. The real trick is the series of diagonal marks made across the surface of the blade to simulate the reflective qualities of metal. Just another method to use without getting into NMM completely. That's a nice effect, might try this out when I'm back on the Space Marines. 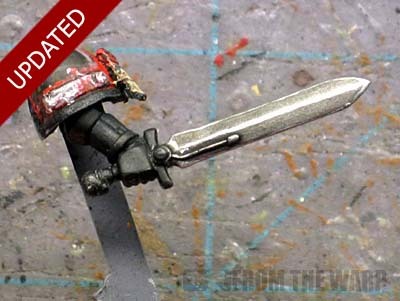 You say this isn't NMM but it looks like the method I've seen people say they use just with a flat base coat. Obviously you would have to be a lot more careful and subtle to make it work but the principle would carry across I think. As an aside I used your lightning tutorial and adapted it to use as the theme for power swords in my army and it worked brilliantly thanks! Great job on the power weapon.. really like it and it looks simple enough to use in some models I have on the table now. Great tutorial, thanks! I've always struggled to highlight swords and the like, this is a huge help! Great job Ron, would not have thought of doing it like. Very cool - that is a neat effect, I'll have to give it a try! Inspirational stuff as always, Ron - keep up the great work! Awesome! I've been curious about this method for awhile now and this is the simplest tutorial I've found. I can't wait to try this out on my Marines! Excellent post Ron! I will be adding this to my "toolbox" as I also prefer using metallics. This is a great way to add more depth. Thanks guys, glad you all liked it! I wasn't sure how this one would go over since there's not much to it. Just a few passes with a couple washes in some key areas and you're done. I like it because of the effect you can get with minimal work. Very cool Ron, I'll have to remember to use colored washes/inks on my power weapons. I tend to like this sort of power weapon over the lightning that the 'Eavy Metal team does now. Another excellent post from you Ron! Definitely going to have to give this a try as I have a ton of Asurmen Blue I bought up before the big changeover. Added to the bookmarks of Tutorials! I'll be using this on my Dark Angels from the DV box set! I really like this actually. 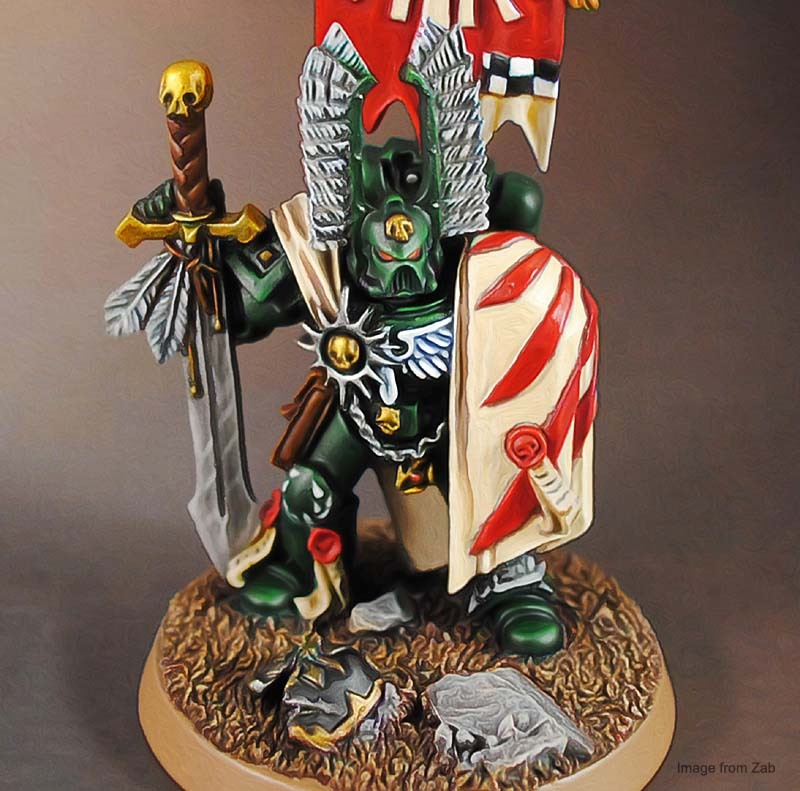 I'll probably have it make it's way to my Grey Knights.